Twenty-three prisoners tried to hang or strangle themselves during a mass protest at Guantanamo Bay in 2003, the US military has revealed. The action took place during a period of several days in August that year, the military said in a statement. A spokesman said the incidents were "gestures" aimed at getting attention, and only two of the prisoners were considered suicidal. Officials would not say why they had not previously reported the incident. The detention centre at the US base in Cuba currently holds about 550 detainees. They are mostly suspected Taleban and al-Qaeda fighters captured during the war in Afghanistan, many of whom have been held for more than three years without charge or access to lawyers. The last four British men held at Guantanamo Bay are expected back in the UK on Tuesday, after almost three years in US custody. Moazzam Begg, Martin Mubanga, Richard Belmar and Feroz Abbasi are expected to be questioned under UK anti-terror laws after their return. The US agreed the men could be released after "complex" talks with the UK. A total of 23 prisoners tried to hang or strangle themselves in their cells from 18 to 26 August 2003, the US Southern Command in Miami, which covers Guantanamo, said in a statement on Monday. There were 10 such cases on 22 August alone, the military said. However, only two of the 23 prisoners were considered to be attempting suicide. Of those 23 prisoners, 16 are still at Guantanamo Bay while seven have been transferred to other countries. 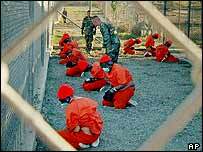 The military has reported 34 suicide attempts at Guantanamo Bay since January 2002. In 2003, there were 350 incidents of self-harm, including 120 "hanging gestures", army spokesman Lt Col Sumpter told the Associated Press news agency. Army Gen Jay Hood, in command of Guantanamo, has said that the number of such incidents has gone down since a psychiatric ward was set up at the camp in 2003. Last year, there were 110 incidents of self-harm, Lt Col Sumpter said. 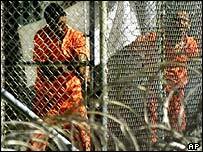 The US government argues that detainees held at Guantanamo Bay are "enemy combatants" outside the jurisdiction of American civilian courts. However, lawyers' groups and human rights activists say the detainees are being denied their legal rights under the US constitution. Amnesty International and other groups have also alleged that prisoners have been ill-treated at the detention centre. The US Supreme Court ruled in July last year that civilian courts did have the right to consider challenges to the legality of foreign nationals captured abroad and held at Guantanamo Bay. Though the military base is on rented land, the US had "complete jurisdiction and control" at Guantanamo Bay and therefore the courts had jurisdiction, a majority of the judges decided.